Cooking isn’t anywhere near my college major, and here I am over a decade later with a real food blog as well as writing for others with food blogs. Ironic isn’t it?! I have never had a cooking class in my life. When I fell into real food it was literally that: I fell into real food. I had my first baby and just wanted her to eat better food than I did as a child. Plain and simple. The very first thing I learned how to cook on my real food journey was bone broth, and how to use it for soup. I wasn’t a huge fan of just drinking bone broth straight up (remember, my taste buds were not used to any of this! ), so soup-making became a love of mine right from the very beginning. Over the last handful of years, I’ve come to learn the art of making really flavorful, delicious soup. A flavorful soup begins with a veggie medley added to a perfectly hot pot with some melted butter. 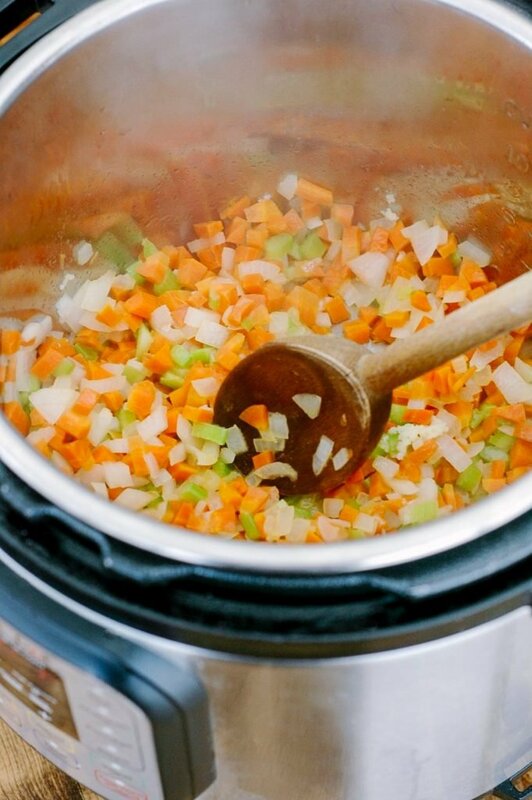 The flavors are sautéed together to create the building blocks for a delicious soup. This is why the sauté feature on the Instant Pot sold me! Sure, I was intrigued by friends making meals in minutes versus hours, but I’ll admit that I was skeptical on how the flavor would turn out. When I learned that I could still layer my flavors and make a really fast meal, I was sold! As much as I truly adore cooking, there are those days or stretches of weeks where projects are due and I just don’t have the time to be standing by the stove all day. My Instant Pot has made it possible to still put nourishing, real food on the table despite crazy schedules. Today’s recipe uses the Instant Pot to make a nourishing meal in under 15 minutes, from start to finish. The soup starts with a quick saute of the vegetables, and then, the rest of the recipe is completely hands-free, leaving you time to check homework, change that diaper, send that email, or…ahem…make a cup of coffee like I did. If you aren’t quite there yet on making your own bone broth, just grab a quality store-bought version. I would rather that you make this fast homemade recipe than grab fast food or an additive-loaded can of soup at the store. If you are ready to make the leap into making bone broth, your Instant Pot will be your best friend. You can make bone broth in the Instant Pot very quickly. You can cook a whole chicken in your Instant Pot in 25 minutes and have lots of budget-friendly chicken meat for the freezer. You can pull out a cup or two when you want to make your soup and just dump it right in! 8 cups chicken broth or vegetable broth, Homemade broth is preferable for extra nourishment but use a quality store-bought broth if you need. 2 cups cooked chicken leftovers cubed, You can add more if you like your soup meatier, or leave it out if you wish for it to be a vegetable-based soup. 2-3 cups chopped spinach amount depends on your preference. Plug your Instant Pot in and push the "Sauté" button. The reading on the front will just say "On," and the bottom of the pot will get hot to sauté. Melt the butter in the Instant Pot. 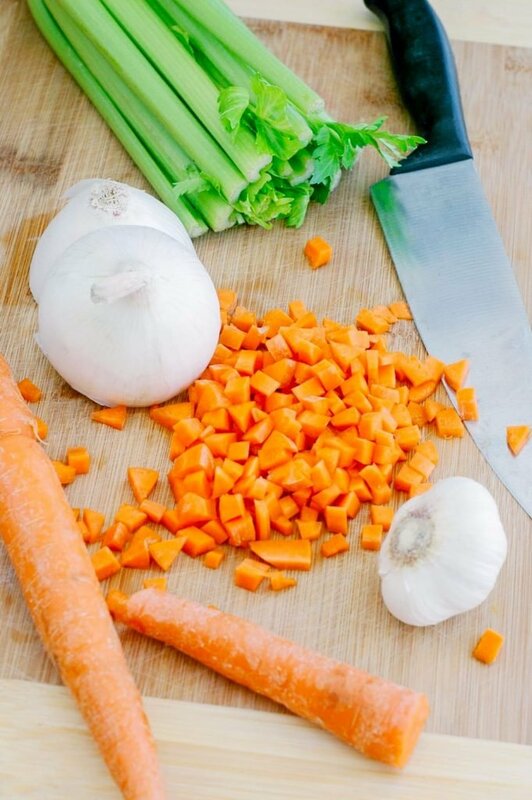 Once melted, add the onion, carrot, celery, and a big pinch of salt to bring out their juices. You can cook the veggies for about 5 minutes until they're soft and sweet. Add the garlic, thyme, oregano, and basil. Cook for 1 minute. Add the broth, chicken, and noodles, and turn off the Instant Pot so the sauté mode turns off. 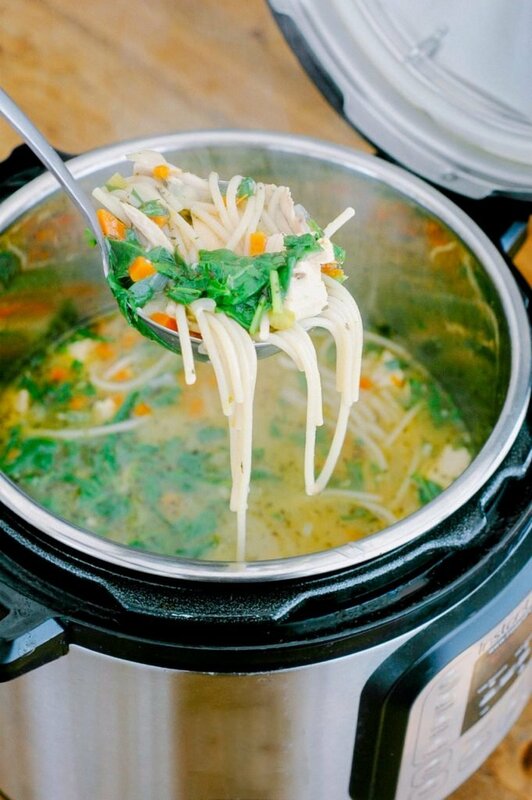 Put the lid on your Instant Pot, turn the vent valve to closed, and push the "Soup" button. Use the manual buttons (the +/- buttons) to bring the time down to 4 minutes. It will turn on automatically after a few seconds. The Instant Pot will take about 10 minutes to come to pressure, and then it will count down the 4 minutes. When the 4 minutes is done, quick release your valve (use a towel or oven mitt to turn the valve). It will take 1-2 minutes to release all of the pressure. After the pressure releases, take the lid off, stir in your chopped spinach to wilt, and more salt and pepper (to your taste). The soup is hot enough to wilt the spinach - no need to add more heat! Taste the soup, and add salt as needed (this will depend on your taste preference and broth flavor). This recipe is specifically developed for an Instant Pot (a dual slower cooker and pressure cooker). 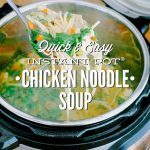 If you don’t have an Instant Pot and want to make homemade chicken noodle soup, I recommend checking out this stove-top veggie noodle version or this crock-pot version. 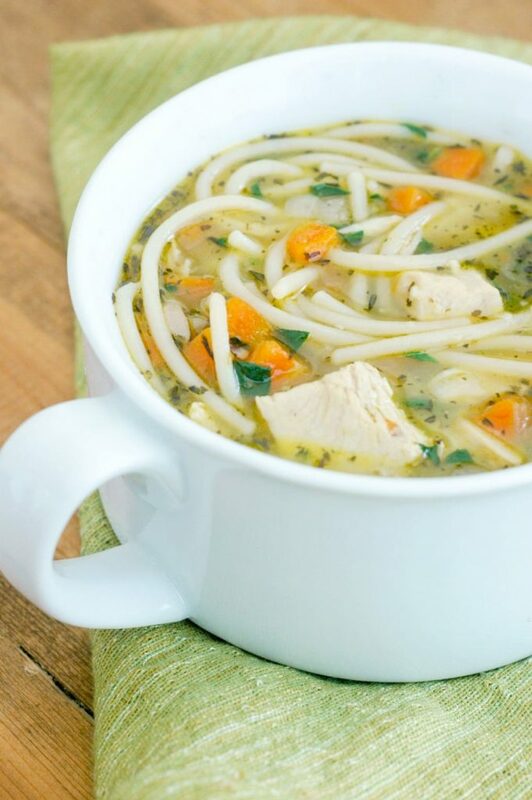 We LOVE chicken noodle soup around here, and there’s no shortage of simple ways to make this classic soup. For more real food Instant Pot recipes, I recommend checking out this list from The Prairie Homestead. 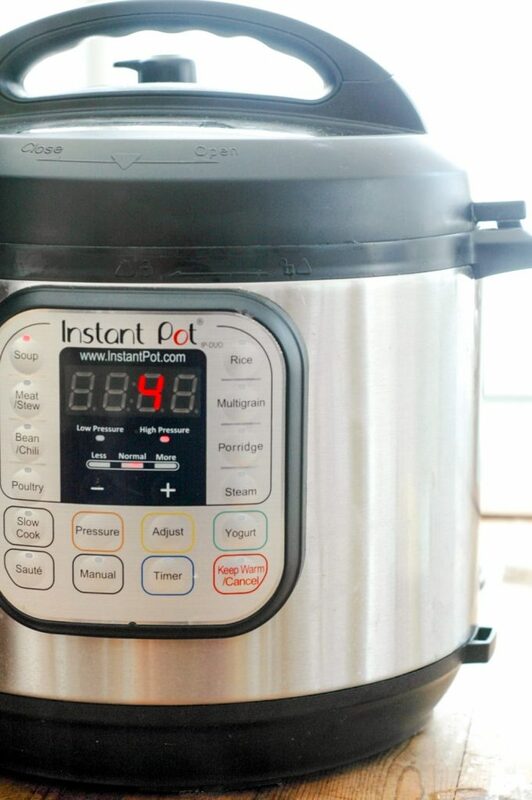 I have never used an instant pot and am intrigued by it. It seems like a convenient tool. However, because I am in such a small home I’m also a bit concerned about the value versus the space. Do you find this to be a tool you use often? 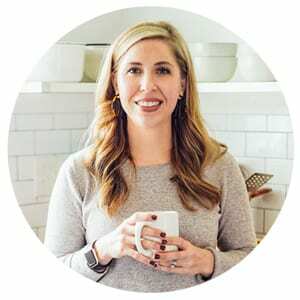 Hey Janel, I was a bit skeptical of the Instant Pot at first, mainly because of the size and my small kitchen space. But after using it for a number of months, I’ve found that I don’t use my crock-pot anymore since the Instant Pot doubles as a slow cooker and pressure cooker. The Instant Pot is really tall versus wide, so it takes up less space than my crock-pot, too. I think if you’re a crock-pot kind of person, and need the ability to get a meal on the table really fast (pressure cooker option), then the Instant Pot is a really great option. I LOVE my Instant Pot and LOVE this recipe! Thank you so much for posting it! I even made it a bit more simple by using two cans of Kirkland brand chicken breast meat. This is a KEEPER! I’m so glad you’re enjoying the soup, Shelley! I’ve beginning to feel the same love toward my IP ;). Kristin! Thank you for that answer! I got one on prime day too and have been debating about the use of my crock pot. I hardly ever used the crock pot to begin with and now I’m thinking it’ll become completely obsolete. I have a tiny NYC kitchen so space is essential! How long would you cook it if you had raw chicken? Tana, if you have raw chicken cut in pieces i would cook it halfway (maybe four minutes) in saute mode then continue with the recipe as directed. If the chicken in in bite size pieces you really don’t need to cook it for that long, if at all before using it in this recipe. Hey Pat, Yes, I believe you can. I would try using 4ounces of egg noodles. This was excellent, but my egg noddles came out like mush. I’m new to the instant pot and want this to be my go-to chicken noodle recipe. Any thoughts on how to fix the noddle issue? Thanks! Egg noodles often go mushy when cooked in soups and when reheating soups. That’s why I believe this recipe calls for spaghetti noodles, which hold up better. I use whole grain spaghettini and it’s perfect. But if you prefer egg noodles, it’s always best to cook the egg noodles separately and add in when serving. This was delightful and easy. Thank you! Hey Joy, I’m so glad you enjoyed it!! This soup….. so yummy! We used leftover turkey broth from thanksgiving and because the turkey had been brined it had so much flavor. I used gf noodles and it was a hit with everyone! That’s so great to hear, Bonnie! I’m working on more Instant Pot recipes for 2016. 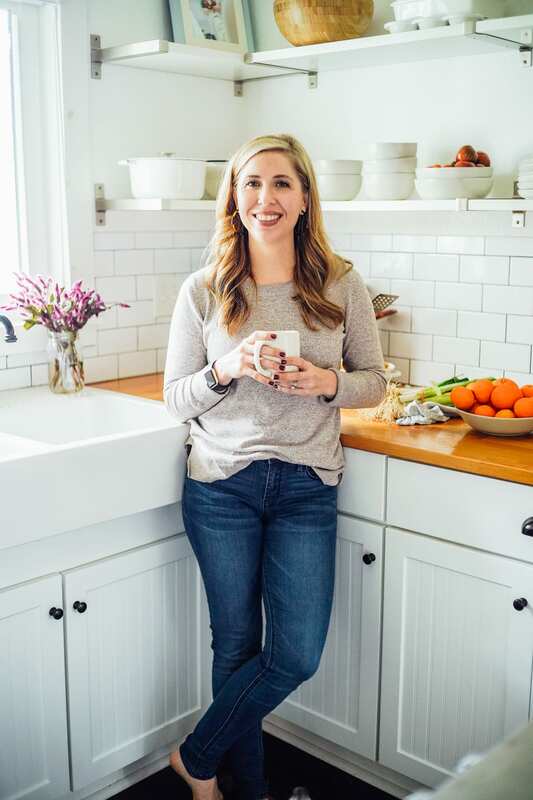 Raising Generation Nourished has a few goodies on her site, too. Also, NomNom Paleo shares lots of yummy real food Instant Pot recipes. Each time we’ve made a soup in the instant pot, we have a huge amount of soup spew out of the steam valve. Any suggestions??? I’m new to the Instant Pot and am still learning — but I just read that the contents shouldn’t be more than 3/4 full. That may explain why there’s soup coming out of the steam release valve. Just made this and it turned out excellent! My 21 year old son says it is the best Chicken noodle soup I have ever made! Thanks so much! I making your lovely soup right now and hoping my egg noodles will be OK I didn’t read these comments till after I began. What’s the soup is done is it OK to leave and warm mode from early afternoon till dinner time? Thank you ! Hey Renee, Hmmm, I’m not sure about leaving the soup on warm mode. I think the pot and soup would be fine, but the noodles may get a bit mushy. I do this with my slow-cooker quite often, so it’s worth trying. Typo on my comment above. Space spaceIt should read when the soup is done is it OK to leave and warm mode for three or four hours? This soup is excellent. Making it for the third time today as we have colds in our houe. Yay, Natalie! I’m so glad you’re enjoying it! I have made this soup numerous times, it’s my favorite! My usual is to make a whole chicken and then use the broth as a base for the liquid. And of course the chicken in the soup. Everyone in my family LOVES it!! That’s awesome, Sharyn! I’m so glad you’re enjoying the soup! Turned out fantastic! We were short on veges, so I used brocolli and peppers with the carrots instead, it added to the flavor and thickness of the broth! Hey Dayna, Thanks for the feedback on the ramen noodles. Ramen is pretty unique in that it isn’t like most noodles–it doesn’t take much to soften/cook them, so I’d recommend adding them to the soup once it’s hot and cooked versus before pressure cooking. Did you use any seasoning with the ramen other than what the recipe called for? This is wonderful Kristin! I think you’ve officially convinced me to the Instant Pot. I have one question, what size pot did you buy, and have you ever found you needed a different size? Hey Nikki, I think you’ll love it! It’s so nice to have it on busy nights/days. I have the standard 6qt pot. I haven’t needed anything larger, even with making broth and soups. I like the frozen ramen noddles texture. How do you think that will work. Hey Renee, I would add the noodles after cooking the soup. Do you mean Reames Homestyle Egg Noodles (that are sold in the freezer section? If so, there would be a big difference between those and ramen noodles. (Do ramen noodles even come frozen?) Just didn’t want you to put the Reames noodles in after the rest is cooked, as I’m sure they wouldn’t not cook quickly like the ramen noodles. So good! We christened our Instant Pot by cooking a chicken, then making bone broth, then using both for this soup. We used egg noodles and skipped he spinach based on what was in the house. Delicious, warming soup. Hopefully, it will kick this cold to the curb! Hey Al, That’s awesome! Great work! I’m so glad you all loved the soup. Hello, how much broth would you add if not using the noodles or the spinach? Thank you. Hey Laura, Hmmm, this is a complete guess. Maybe 4-6 cups? I just got an Instant Pot for my birthday and had some leftover chicken from cooking a whole chicken in it. I tried out your soup recipe and it was delicious. I added a couple parsnips and a sweet potato and left out the spinach. My family ate it up! Thanks for a great, easy to follow recipe. It’s definitely one for the Instant Pot recipe box. Came out great, but low on broth. Going to add another 2 cups of water with Better than Bouillon. Flavor is on point!! !